Even if you’re happily paired with that special someone, the thought of Valentine’s Day can still strike fear into the hearts of budget-conscious lovebirds. From costly dinner arrangements to over-the-top gestures, romance comes with a price. But don’t panic—we’ve gathered a list of some of the best DIY Valentine’s Day gifts for men, all of which are sure to please without breaking the bank. Inexpensive and easy to make, this scratch-off Valentine’s Day card is a fun and creative alternative to more traditional card options. Include prizes like “Massage,” “Kiss,” or “Homemade Dinner” for a creative gift he’ll want to cash in right away! He may not want flowers, but that doesn’t mean he’s opposed to bouquets of all kinds. Each of these single-shot bottles costs about a dollar at most liquor stores, and you can use any type of container as the vase, making this boozy arrangement a budget-friendly gift he’ll definitely appreciate. Instead of just telling your beau you love him on Valentine’s Day, how about you give him a list of 52 reasons why you do? This adorable booklet is a great option for a sweet, sentimental guy. All you need is a deck of cards, a pack of labels (or homemade ones), a hole-puncher and some ribbon or binder rings. Mason jars help lend an old-fashioned, rustic feel to any space. For a guy with a love of all things vintage, these creative frames make a great way to display photos of the two of you. I Love You Beer-y Much! Spice up his favorite six-pack of craft brews with darling Valentine’s-themed labels. You can either design your own or print off some of the free ones available online (Pinterest is bursting with them)—either way, your stud will love this grown-up take on Valentine’s Day. These clever candy jars are just the thing for a man with a sweet tooth. 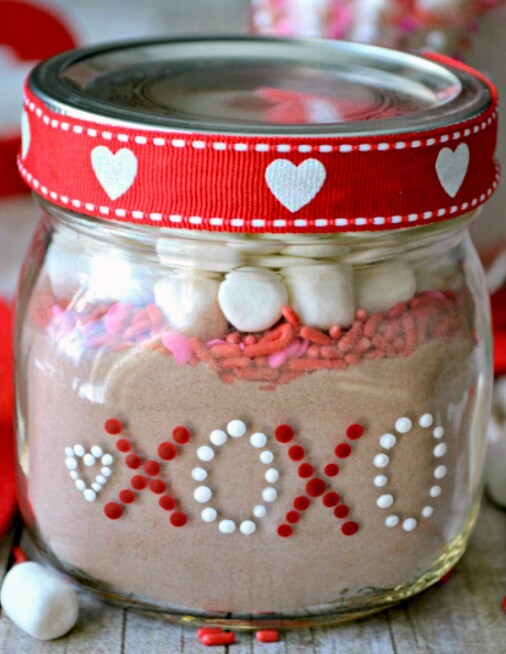 Buy some small, lidded jars at the dollar store and fill them with his favorite candy. To make them Valentine’s-appropriate, label them with messages like “Love you to pieces!” for Reese’s Pieces or “Mint to be!” for York Peppermint Patties. They say the way to every man’s heart is through his stomach, and we know very few who would turn down homemade baked goods. Take those chocolate chip cookies to the next level by making them heart-shaped—nothing like a good theme. We love the rustic look of these coasters combined with the sweet sentiment behind them! Use small pieces of wood and paint you and your honey’s initials on the pieces. If you’re feeling more traditional, you can even carve them. When you’re done, you get an adorable and functional Valentine’s Day gift. These DIY mugs are a great gift option if your sweetheart is a coffee or tea drinker. Just pick up a couple of plain white mugs, your choice of Sharpie and voila! You know he’ll be thinking of you every time he sips his morning cup of joe. Combat the cold weather and warm his heart with this crafty hot chocolate mix. It’s a fun, simple and delicious gift idea for that special someone. When all else fails, one of the simplest but most thoughtful things you can do for your Valentine is prepare a home-cooked meal. Your dinner will be better than whatever you would have gotten at that fancy Italian restaurant because it was cooked with love—plus, it’ll save you both a lot of money. Skip the crowds and spend an intimate evening with your special someone instead.